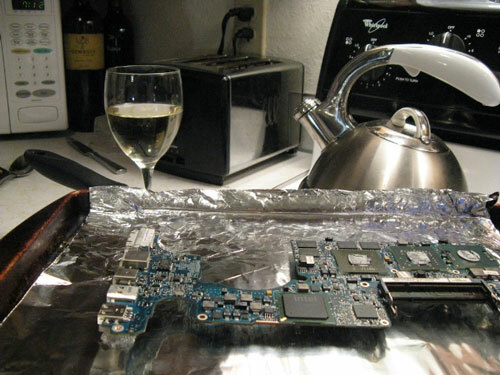 Wondering what pairs best with a refried MacBookPro logic board? Well, just in case you were, my suggestion would be a 2008 Viognier from Coeur d’Alene Cellars (full-disclosure: they are a client of mine and they keep me supplied). I would also recommend as an après-bake maybe a Merlot. I happened to have the remains of a 2007 Hogue Genesis Merlot that filled in quite nicely. I needed it as I was In the process of baking my MBP logic board for the second time. As it turns out, almost exactly three months. Three months and one day to be exact for my case. The system first went down on March 27, 2010. I originally baked it and got the system back up on April 2, 2010 and it lasted until July 3, 2010. After putting my system to sleep for the night by closing the lid and going to bed last Friday night (like I normally do), I discovered the next morning when I went to open the case, that my glowing/pulsing power light was off—just like the last time. I then proceeded to open the lid and nothing. After a quick press to see if I could wake the system up, I held the power key down to power-down the system. No sound, Nothing. I then pressed the power button again and, just like before, I heard a whirring of the optical drive and the glowing/pulsing power light came on, but nothing else. No start-up chime, no screen. Nothing. When I left the system on for a little while, it would heat up as if it were running, but there was never any hard drive spinning, whirring, clicking sounds indicating the hard drive was being accessed. Rather than waste any more time trouble-shooting and after a quick-glance at Craigslist didn’t produce any incredible “I have to give away my perfectly good MBP because I’m stupid and switching back to Windows XP” offers, and the fact that I hadn’t yet secured the necessary funding to replace my system outright like I had hoped to do before this situation occurred again, I quickly committed myself to doing another bake-off in the evening after the family had gone to bed. Since basically what I did was the same exact thing that I outlined in my earlier Cooking the Books article, I won’t bore you with the details again. Suffice it to say, that I did the entire process in easily half the time that it took me originally. I’ve gotten quite comfortable tearing apart my system and putting it back together. I also didn’t have to keep running back to my other desktop system to reread an article or re-watch a video—I knew what I was doing this time. I just went to my original article, double-checked the temperature and timing (375°F for 7 min and 30 sec). I did do something different this time in that I increased the heat slightly to 385°F just to see if it would soften the soldering joints more thoroughly this time. It would probably be helpful to have an accurate oven thermometer if you were going to do this on a regular basis—that and it comes in handy for baking real food too. After cooling (er, resting), I re-assembled my MBP and then trepidously pressed the power button and viola: my system came to life without even rebooting—it restored the session from the sleep state that I put it in the night before (note to Apple engineers: there’s a clue there somewhere). This is after repeated powering down and up and then the removal of the battery and then the whole logic board! I didn’t try booting without the battery like I did last time—so that’s possibly a clue too. I went ahead and shut all the apps down and rebooted the system just to clear all the cobwebs and was pleasantly surprised that I didn’t have to reset my passwords again like last time. Again, probably a result of not trying to power up without the battery or zapping PRAM and all the other keyboard/bootup sequences I tried the first time this happened. The other good thing about this time around is that I recovered a broken USB port that I had lost with the last baking session. It had retained the ability to pass power to an item (so I used it for my cooling base) but no drives were recognized when plugged in. So, that is cool, because I have several drives and peripherals that I run off the USB ports and it had cramped my style on more than one occasion. So, all that is to say that if you ever find yourself in the situation of having to bake your mother board and wonder how long is this going to last? In my case it was right around 3 months. The good news is that the system seems to be able to handle at least one repeat baking, but how many more is a big question and I’m not sure I really want to make more of a habit out of this—no matter how fast I get at doing it. So, I’m on an accelerated plan to replace my system as soon as I can. I’ll let you know so you can be sure to check Craigslist for a “not-so-perfectly good MBP because I’m stupid and didn’t get Apple’s 3-year extended warranty and now I have to sell it for a fraction of its normal resale value” deal. Now, where’s that Merlot? If you haven’t made it too painfully obvious that you’ve baked the board in the system a few times, you might try to get to a service provider to get it covered under the nvidia extension program. They’ve recently changed it to four years and have decided that if it doesn’t produce a code with their diagnostic program not to dismiss it outright. I can’t do it with the machine I’ve fixed the same way for various reasons, but it’s useful to have a figure of how long this worked for you. Mine’s been going strong since june 19th. Problem is there aren’t many Apple service providers in Spokane area until our Apple Store opens hopefully this fall. The one I did take it to tried in vain to get Apple to accept it under the Nvidia issue. They even encouraged me to write to them directly and beg. I tried to use the tact that between my own purchases and corporate purchases that I have been responsible for over the past 20 years or so (well north of $100K) and the fact that I have been involved in helping more people than I can remember switch from Windows to Mac–all to no avail. I need to take a trip to Seattle and visit an Apple Store there. I also have a bulging battery and frayed power cord for them to replace. The trials of not having an Apple Store close by. heating my oven now for the second time as you. Before first and currrent failure, i had my computer calculating models for hours at 80 degrees plus. So i think the temperature is killing it. If this second bake works, I wil stop using my laptop as my primary workhorse. I also installed a free app that incased the fanspeed, this wil probably help a bit. thank for the original post ! got a link for that app? If I can bake-start my macbook, I might want to look into it. Any clues/hints/help on doing the same to an Imac?